Italy's romantic cities, inspiring landscapes and delicious cuisine make it a holiday destination with a very wide appeal. Wherever you travel in Italy the engaging culture, scenic countryside and endless hours of sunshine combine to make it a fantastic group villa holiday destination. Rent a large apartment in Rome, Florence, Venice or Naples; hire a luxury villa in Sorrento near the famous Amalfi Coast; or stay in a large farmhouse in Tuscany, Umbria, or the heart of Le Marche. Further south, rent a spacious villa or self-catering apartment in Apulia to escape the crowds and discover rocky coves and sandy beaches. Or book a large holiday villa in Sicily or Sardinia to explore woodlands, beaches and superb archaeological sites. We have big holiday rentals in Abruzzo, Apulia, Calabria, Campania, Emilia-Romagna, Lazio, Liguria, Lombardy, Marche, Piedmont, Sardinia, Sicily, Umbria, Veneto and other regions of Italy, all sleeping 10+ ideal for big families and groups who want to stay together under the same roof. 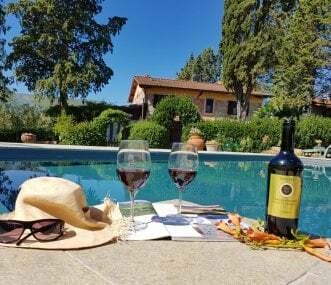 A beautifully restored country villa, sleeping 14-18; 15 minutes by car from Lucca, with swimming pool set in 28 hectares of gardens, olive groves, vineyards and woodland. Medieval hamlet nestled in a large estate, incredibly beautiful surroundings, ideal for events and family gatherings. Sleeps up to 20 people, in 3 different independent units. 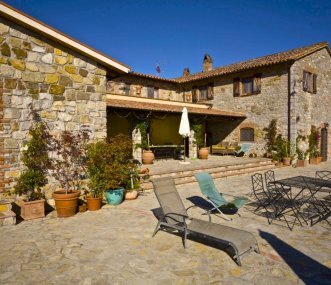 Tuscan farmhouse sleeping 22 with a swimming pool in the Chianti countryside, within easy reach of Florence and Pisa. For family holidays, wine tasting and gastronomic breaks, celebrations. Il Povile is a fascinating mansion eco friendly, newly restored in the Roman countryside, immersed in a 42 acres park with a 360° panoramic swimming pool chlorine free overlooking a stunning view. Private manor house with panoramic view, situated in private grounds of 220 acres. Sleeping 24 with 14 x 7 metre swimming pool. Perfect for weddings, hen or stag parties, large family celebrations. 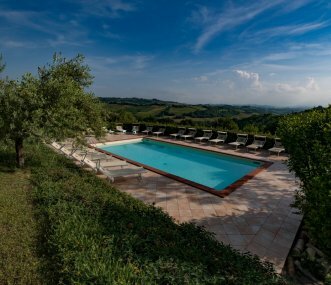 Farm relais Villa Pomegranate is perched on a hilltop in the heart of Marche. It's the perfect place to enjoy rural life, overlooking unspoilt scenery whilst benefiting from all the comforts. Imagine staying in a beautiful big apartment in Sorrento; a villa in Tuscany or Puglia; a guesthouse in Rome, Florence, Venice or Naples; or a spacious holiday home in Umbria. At Group Accommodation, we work hard to fulfill these dreams, and as a specialist group holiday company we are dedicated to bringing you the best big group holiday homes in Italy. It's not easy choosing where to stay in Italy, with such a fabulous range of famous historical cities, beautiful coastlines, gorgeous rural landscapes and excellent group holiday accommodation. Rent a large villa in Tuscany, one of Italy's most famous regions, and you can take in the landscapes that have inspired generations of artists and writers; enjoy a day at the beach in Viareggio; explore the beautiful cities of Lucca and Siena; and see the Leaning Tower of Pisa. Or take a city break at an apartment in the beautiful Renaissance city of Florence. 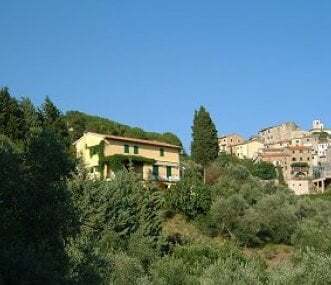 Hire a holiday villa in neighbouring Umbria and you can enjoy similarly beautiful landscapes, fascinating towns and cities such as Perugia, Todi, Orvieto and Castiglione del Lago, and visiting famous places such as the Church of St Francis in Assisi. Stay in group holiday accommodation in Abruzzo and you'll enjoy wild, uncrowded landscapes; you can visit the regional capital of L'Aquila with its 16th century castle; and ejoy sandy beaches at Pescara, followed by a stroll along the seaside promenade. Visit Sulmona, a medieval town famous for its sugared almonds, and Teramo, nestled between the highest mountains of the Apennines and the Adriatic coast. 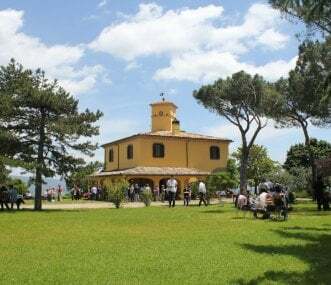 Hire a holiday home near Rome in Lazio and you can discover Italy's capital at your leisure; visit lakes and go hill walking; and travel east to Tivoli, with the garden of fountains at the Villa d Este and the well-preserved grounds of Hadrians Villa. You can visit famous monasteries such as Monte Cassino, or head to Frascati, which is famous for its wine. Then there's the coastline, which is made up almost entirely of beaches, and is well-known for its fabulous fish restaurants. If you choose a holiday house in Marche you can get a taste of authentic central Italy, enjoying beautiful Adriatic beaches and visiting ancient hilltop towns, and travelling through unspoilt rolling farmland -- without battling the crowds found in Tuscany. Absorb mountain vistas in Monti Sibillini National Park; enjoy the woodlands and spectacular cliffs around Conero Riviera; and visit medieval Fiastra Abbey in Tolentino. In the north east, find a big holiday rental in Veneto _ either group accommodation in Venice, or a holiday villa outside of the city and you can go sightseeing along the Grand Canal; visit the islands of Murano and Burano; explore Verona, the city of Shakespeare's Romeo and Juliet; see the pilgrimage site of Padova; and enjoy spectacular views of the Dolomite Mountains from Cortina d'Ampezzo. In south western Italy, if you stay in a holiday villa in Campania you'll be within easy reach of a wide range of famous tourist destinations. You could stay at a hostel in Naples or hire a big villa on the world-famous Amalfi Coast; stay in an apartment in Sorrento or hire a holiday home on the Isle of Capri. While you're in Campania you can visit the pretty seaside town of Positano; take a trip to the island of Ischia; climb up Vesuvius; explore Cilento and Vallo di Diano National Park; and see the amazing Roman archaeological sites of Pompeii and Herculaneum. In southeastern Italy, "the heel of Italy", hire a holiday villa in Apulia and you can visit the Gargano National Park and the Tremiti islands; wander around the Old town in Bari; head to Itria Valley to spot the traditional Apulian dry stone huts with conical roofs, known as Trulli; visit Castel del Monte and Castellana Grotte; or spend time on the beach in Monopoli or Santa Maria Al Bagno. On the opposite site, forming Italy's toe, you can hire a large holiday villa in Calabria, a rustic region best known for its pristine beaches and idyllic rural landscapes. Mild in winter and hot in the summer, the region is surrounded on three sides by different arms of the Mediterranean: the Ionian to the east, the Tyhrrenean to the west, and the Strait of Messina to the south, and offers a tranquil holiday destination. Alongside the many beautiful regions of Italy, you could also look at large holiday homes in Sicily or apartments in Sardinia, two large, sunny islands with wild and spectacular coastlines, delicious homegrown produce, rugged mountains, and medieval towns. We try to make it easier for you to decide where to stay in Italy by offering detailed property descriptions and images for every holiday home in Italy, alongside a list of activities available nearby. Our large group holiday homes in Italy are scattered across the country, so you can find large holiday properties in Abruzzo, Apulia, Calabria, Campania, Emilia-Romagna, Lazio, Liguria, Lombardy, Marche, Piedmont, Sardinia, Sicily, Umbria, Veneto and other regions of Italy. Our selection of accommodation for large groups is unrivalled, and you can be confident that we have a large holiday villa in Italy that will suit your needs. Our impressive portfolio features large holiday apartments in Italy as well as other types of group accommodation such as guesthouses, big villas and historic buildings. Make your search for group accommodation easier by using our easy-to-use website bringing together the best big holiday villas in Italy for you to choose from. You can browse all of the properties in Italy using our Regional Search, or you can choose the country in our Main Search and then narrow down your results by several criteria such as location, property type, and how many the holiday villa sleeps.